Federal Reserve Chairman Jerome Powell gets a fresh chance Thursday to signal his tolerance for keeping interest rates on hold as he and colleagues monitor risks to the U.S. economy. Minutes of Fed officials’ Dec. 18-19 meeting released on Wednesday showed many policy makers felt the central bank “could afford to be patient about further policy firming.’’ That’s a more dovish tone than the gradual rate hikes the central bank telegraphed last year. Powell is scheduled to speak at 12 p.m. in Washington. Central bankers raised the benchmark lending rate last month and said some “some further gradual increases’’ would be consistent with continued growth. Investors initially viewed the statement as hawkish, deepening stock-market losses. Bloomberg News reported two days later that President Donald Trump had discussed firing Powell and the month became the worst December for stocks since the Great Depression. However, the record of their discussion during the meeting revealed that policy makers preferred a more cautious approach -- one that dovetails with their subsequent comments. New York Fed President John Williams, in an interview with CNBC on Dec. 21, described the Fed’s statement as “not a commitment or a promise.’’ Powell, speaking on Jan. 4, said he’s “listening sensitively to the message that markets are sending” about downside risks. Charles Evans, president of the Chicago Fed and a Federal Open Market Committee voter in 2019, said Wednesday he foresees possibly three more hikes before the current rate cycle peaks. But because inflation looks stable around the Fed’s 2 percent target, “I feel we have good capacity to wait and carefully take stock of the incoming data and other developments,’’ he said in Riverwoods, Illinois. The minutes highlighted the range of downside risks policy makers are facing, such as the possibility of a steeper downturn in global growth, an escalation of the trade war, or a larger-than-expect impact from their current tightening so far. U.S. central bankers projected above-trend economic growth for this year in their December forecasts, and they expect the unemployment rate to fall further. Those forecasts appear supported by a robust December labor-market report. The economy added 312,000 nonfarm jobs, the most in 10 months. However, factory gauges from regional Fed banks indicate weakening activity as does a service-industry index tracked by the Institute for Supply Management. There are also signs that higher borrowing costs are affecting interest-rate sensitive sectors of the economy such as home sales. The Fed has raised rates nine times since late 2015. 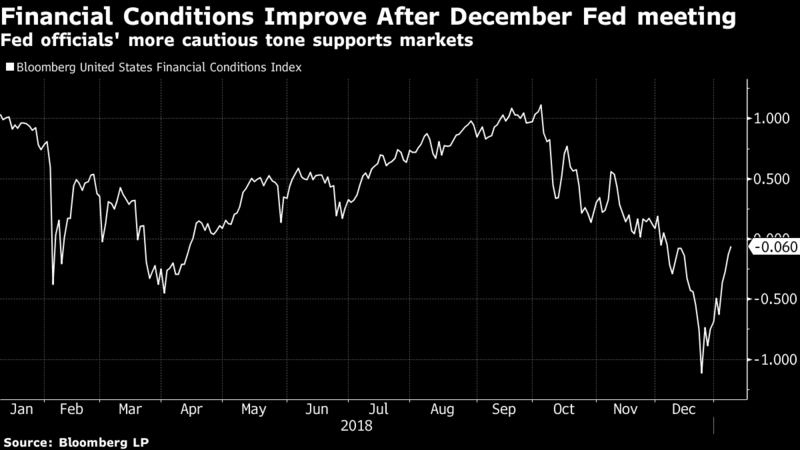 “Uncertainty is higher,’’ said Michael Gapen, chief U.S. economist at Barclays Capital Inc. “Their message is, ‘We are seeing some softening in these sectors and that tell us growth will be ebbing in the next couple of years. Why not be patient for a while and see how it plays out?’"